Healthy Spines Chiropractic uses the AcuGraph (Digital Meridian Imaging) system as part of an integrated approach to your healthcare. The practitioner will give you more information about the role of AcuGraph in your care and why your practitioner has chosen to use this equipment. 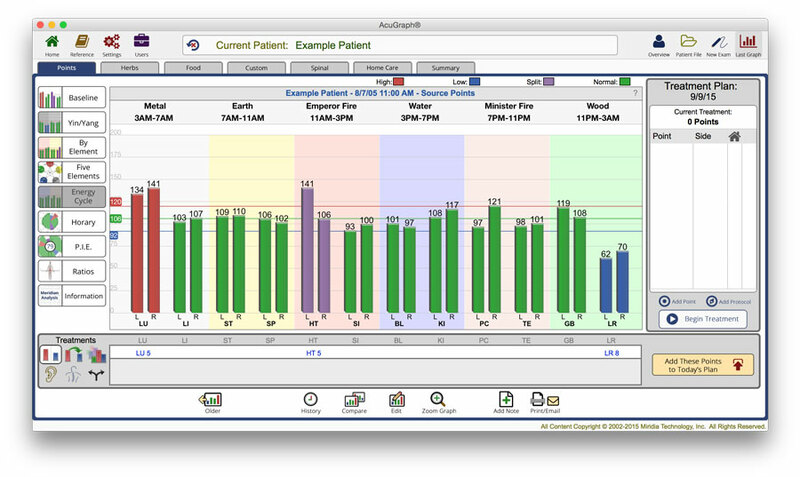 The AcuGraph Digital Meridian Imaging system is a computerized tool used to analyze and document the energetic, status of the acupuncture meridians. Your healthcare practitioner will use the system in a short examination by touching a moistened probe to acupuncture points on your hands and feet. YOUR FIRST VISIT AT HEALTHY SPINES CHIROPRACTIC. Your first visit should take about 30 to 45 minutes. This includes the Consultation, History and Exam/ AcuGraph, and your treatment based on the findings in your exam. Everyone must fill out paperwork as part of becoming a new patient. This paperwork helps us to understand you and your condition more. If you are visiting with Dr. Heather for the first time please complete the new patient forms and bring them with you to your first appointment. Once the paperwork has been completed, you will have a consultation with the Dr. Heather to discuss your health-related problems, concerns, as well as potential treatment options. At this point Dr. Heather will determine if your conditions is appropriate for Acupuncture care. Once Dr. Heather has consulted with you and determined that Acupuncture care is appropriate for your condition she will sit down with you and discuss your personal health history and the history of your specific condition. Once your history is taken Dr. Heather will preform specific test to complete your Acupuncture exam on your Acupuncture condition. Here at Healthy Spines Chiropractic we do same day treatments if your condition is appropriate which will be discussed in your consultation and exam. This means that after your History and Exam are completed Dr. Heather will provide you with a specific procedure for your condition. This procedure is dependent on the condition and the findings from the History and the Exam. At the end of the day Dr. Heather will give you a call to see how your first visit went and to answer any questions you may have. Your next appointment should take about 15 to 30 minutes. We recommend scheduling this within a day or two of your first visits. We also recommend that you bring your spouse or someone special to you because at this appointment we will be going over a lot of important information. This visit will consist of a report of findings this is where Dr. Heather goes over the findings from your previous visit with you. Dr. Heather will also present you with a treatment plan especially designed for you and your specific condition. Chiropractic is the manipulation of two apposing joints moving into "anatomical position." What does this mean?? It means that a Chiropractor who has been trained to look for segments that are not in their proper alignment to do a specific technique called an Adjustment. The Adjustment moves the joint back into a functioning state. Your first visit should take about 30 to 45 minutes. This includes the Consultation, History and Exam, and your treatment based on the findings in your exam. Once the paperwork has been completed, you will have a consultation with the Dr. Heather to discuss your health-related problems, concerns, as well as potential treatment options. At this point Dr. Heather will determine if your conditions is appropriate for chiropractic care. Once Dr. Heather has consulted with you and determined that chiropractic care is appropriate for your condition she will sit down with you and discuss your personal health history and the history of your specific condition. Once your history is taken Dr. Heather will preform specific Chiropractic test to complete your Chiropractic exam on your Chiropractic condition. Here at Healthy Spines Chiropractic we do same day treatments if your condition is appropriate which will be discussed in your consultation and exam. This means that after your History and Exam are completed Dr. Heather will provide you with a specific adjustment for your condition. This adjustment is dependent on the condition and the findings from the History and the Exam. At the end of the day Dr. Heather will give you a call to see how your first visit went and to answer any questions you may have. Massage is bringing awareness back to your body through touch. It can be either relaxing for therapeutic effects. Massage is always different to everyone., so that is why Healthy Spines Chiropractic takes that into account and they have Massage Therapist that will fit perfectly for the needs of their patients. Here at Healthy Spines Chiropractic we recommend that everyone get a massage. When we say everyone we really mean EVERYONE. Why because we like to help those in discomfort. When we say that everyone is in discomfort it is because everyone sits, stands, walks around, they work on computers for long periods of time, and then they suddenly become active doing what they love most in life which causes excess strain on the muscles, so why not get a massage? With a massage at Healthy Spines Chiropractic we like to treat everyone that comes in as a unique person rather than giving them the same massage every time they come in. By saying that everyone is different is because not everyone is the same and that is not a bad thing it’s a great thing. When you get a massage from our therapist they will listen, understand and plan for your session and chose what the best massage modality will be for you as a client to make you feel your very best when you leave . In the past Massage Therapy has been labeled with the use for woman and only for relaxation which is not the case. Men too suffer from the same conditions as woman and therefor can get a Massage as well. While Massage Therapy is great for relaxation it is minimal compared to the numerous health benefits to the individual. The health benefits range from improved circulation, to helping with digestive disorders, to headaches, and even sleep issues. Dont take our word for it click HERE to see what they MAYO clinic says about the benefits of Massage Therapy. HERE are the top 25 reasons according to the American Massage Therapy Association. All conditions should be advised by their doctor if this is service is best for them. While most other massage locations offer one type of massage per session we take a different approach and offer a massage per clients needs. One patients deep tissue massage is another's Swedish Massage, so why stereotype the massage. Another reason why do not specify which massage a patient should get is our body areas differ from one to another. One area may need deep tissue while another area needs a lighter gentler approach, so we customize our massages to our patients. YOUR FIRST MASSAGE AT HEALTHY SPINES CHIROPRACTIC. We recommend that your first Massage at Healthy Spines Chiropractic be scheduled for an hour session. The reason being is so that you and the massage therapist here becomes antiquated with your condition. It is difficult to determine the level of care and the number of sessions you need with a half hour session. This is the reason we offer a great discount for your first massage appointment with us. Everyone must fill out paperwork as part of becoming a new patient. This paperwork helps us to understand you and your condition more. Specific conditions and medications are important to note as there are many contraindications that your massage therapist should know about before giving you a massage. Once the paperwork has been completed, you will have a consultation with your massage therapist to discuss your health-related problems, concerns, as well as potential treatment options. At this point your massage therapist will determine if your conditions is appropriate for massage care. Depending on your condition and what you Massage Therapist say about the session it should be about every two weeks just to keep up with maintance and in case you feel some tension we could get rid of it before it cases anymore problems .